Today Mike and I hung nine of the 14 quilts I’ve collected over the past twenty plus years at the Northwest Quilters Guild show. 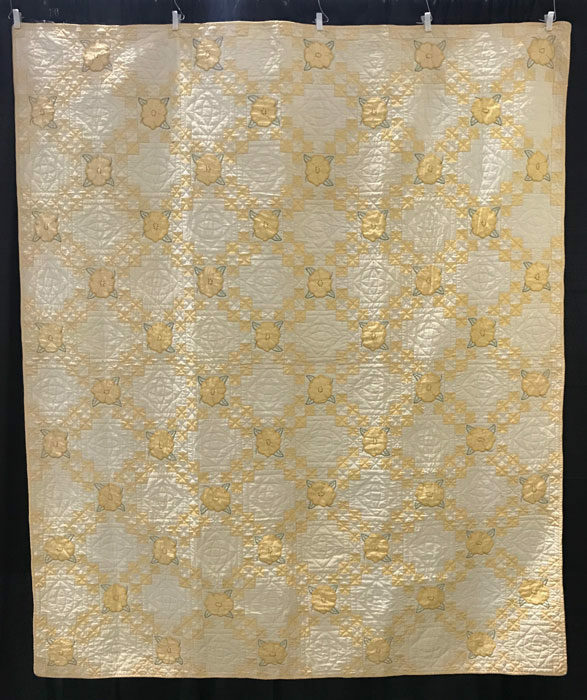 The focus of the collection is simply the color yellow–my favorite color. Yellow makes me feel positive and happy. 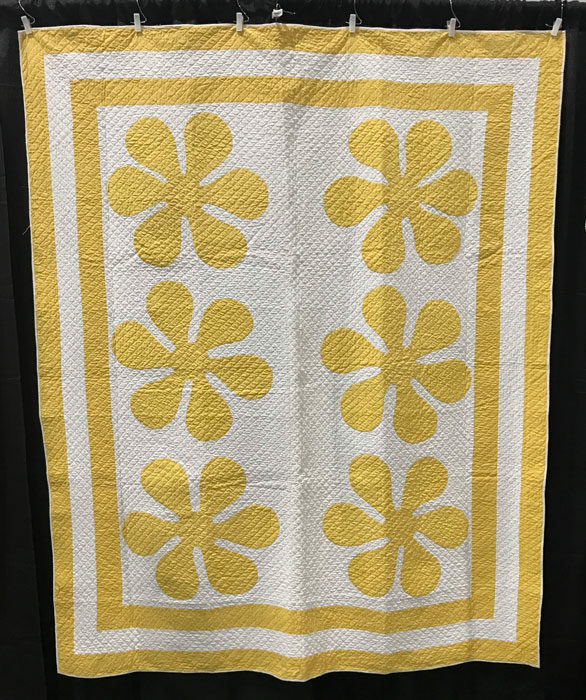 A side benefit to hanging the quilts was the ability to take photos. 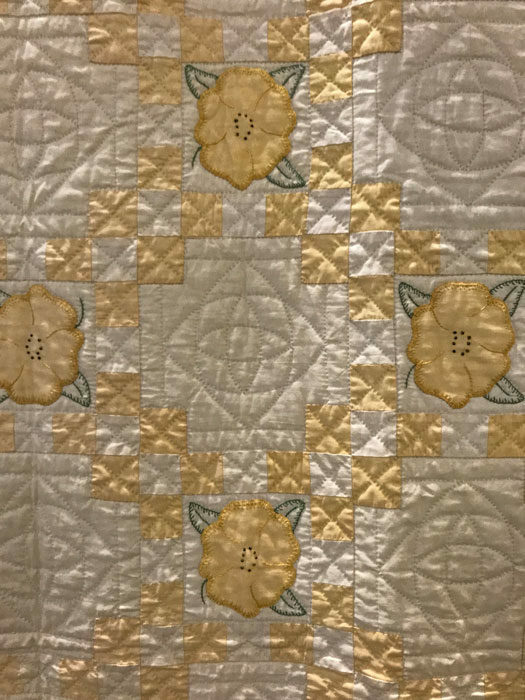 I had one of the quilts hanging in the stairway of the last house I lived in, but it was impossible to take a full-on photo. As we hung the quilts Mike commented that most of them weren’t square or straight on the sides. Yes, I said and that continues to be a problem today for quilters. 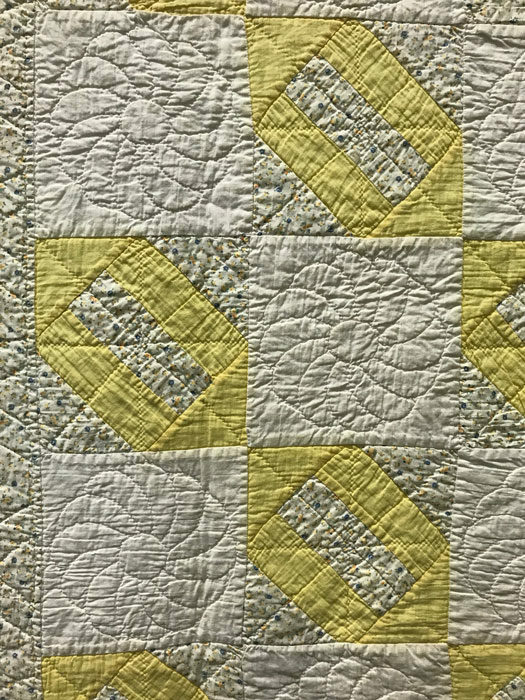 It seems the larger the quilt, the harder it is to make the outside edges straight. And I imagine it was even more difficult in times past. 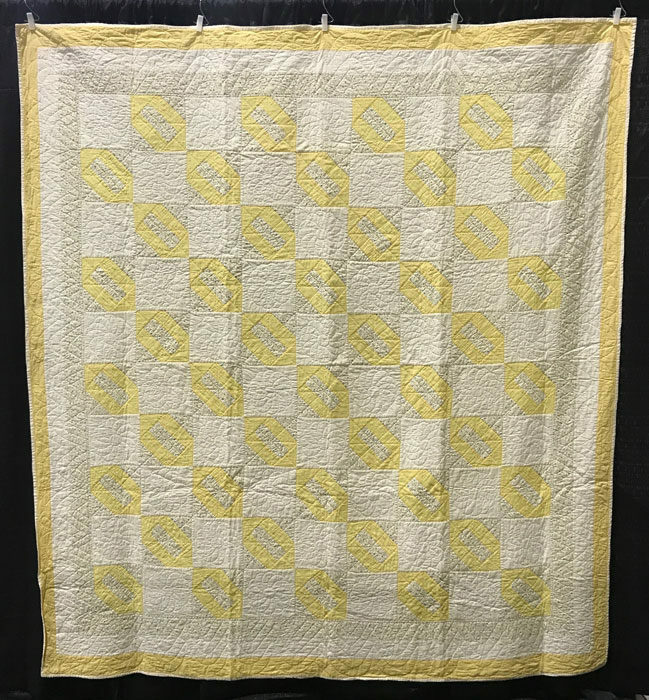 Below is the first quilt I ever purchased. I found it in an antiques shop in Vermont while living in Montréal. 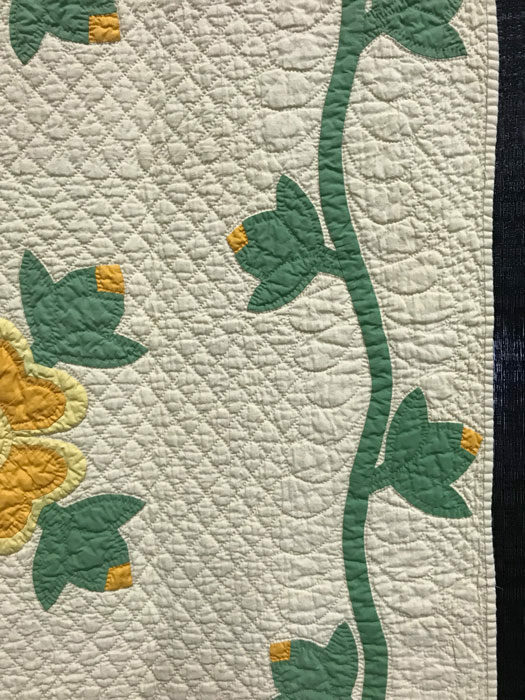 I liked the quilt because it features two of my favorite things: quilting and embroidery. 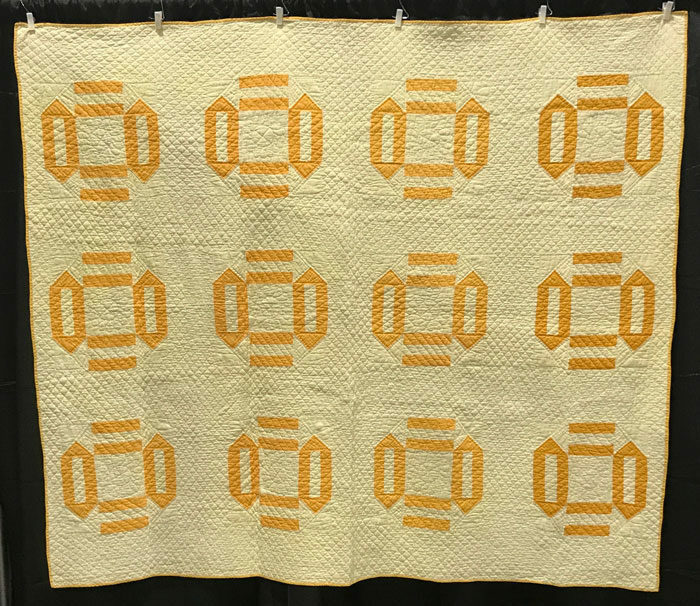 The pattern is a Double Irish Chain with an intriguing quilting design in the alternating blocks. This is the quilt I had hanging in my last home. It perfectly fit the Colonial Revival architecture. 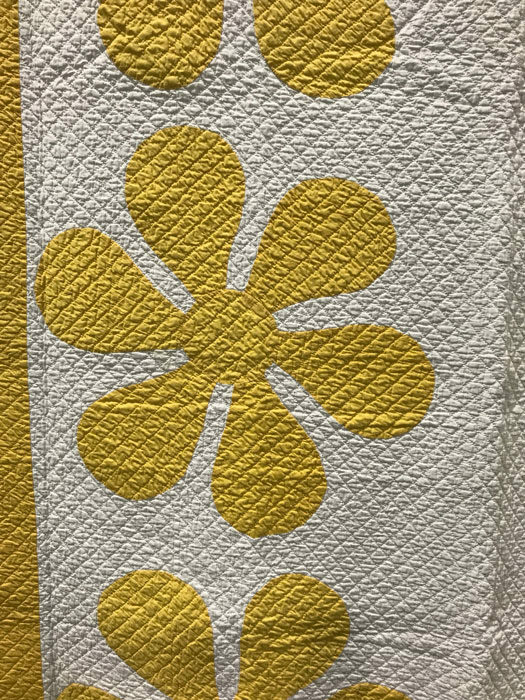 This Daisy quilt looks very modern and strikes me that it could have been made today. I call myself an appliquér rather than a piecer. 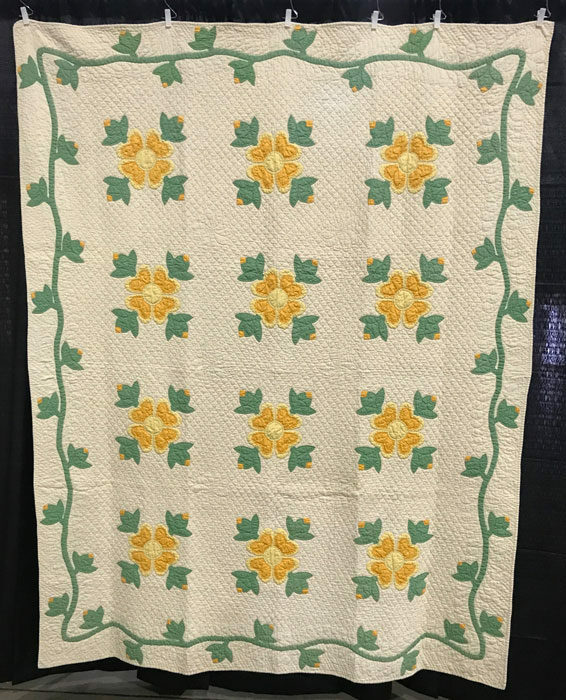 I find the dogwood pattern popular in the 40’s very endearing, and it reminds me of the Dogwood Trail in Paducah that I saw the first time I went to the big quilt show in 1994. 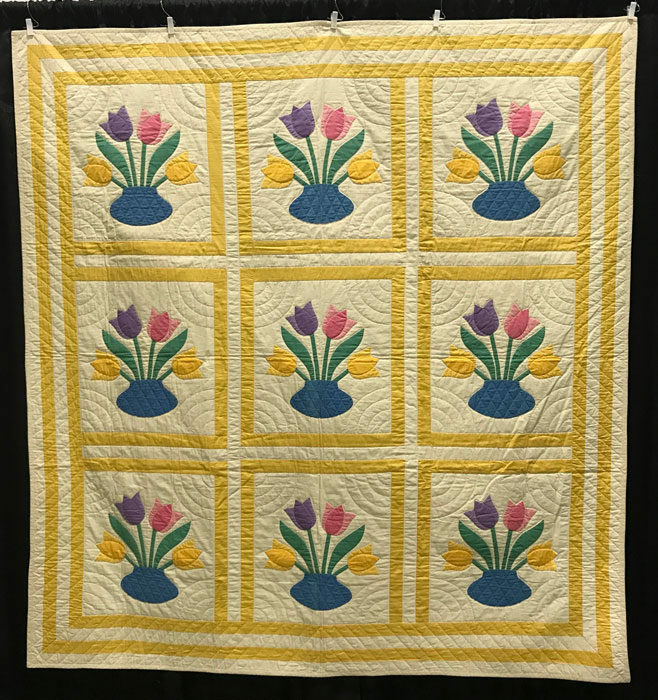 Notice the feather quilting in the border detail image. 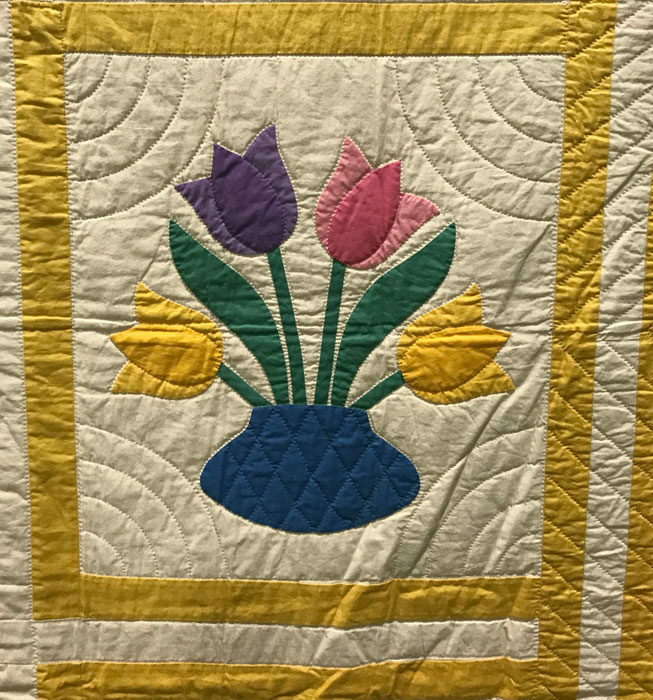 This tulip quilt is bright and bold, much like the six-block Daisy above. 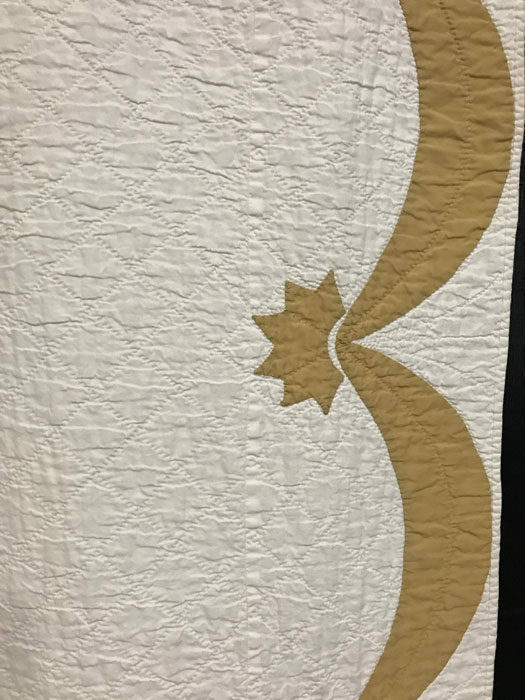 Great contrast between the appliqué and curved quilting lines. 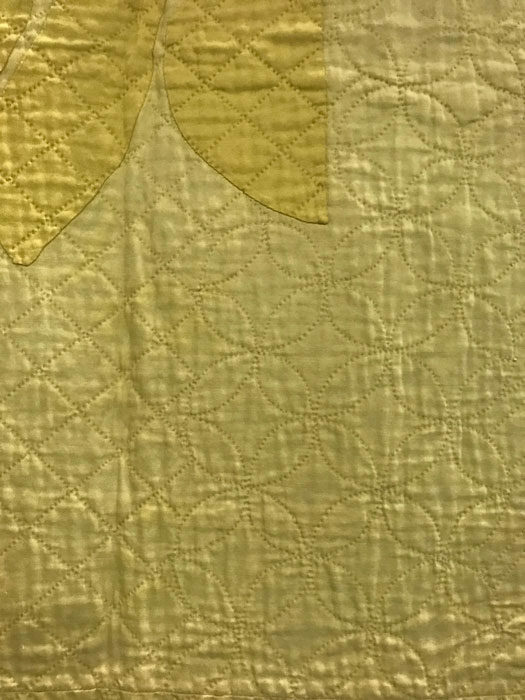 Scalloped edges on appliqué quilts are so elegant. 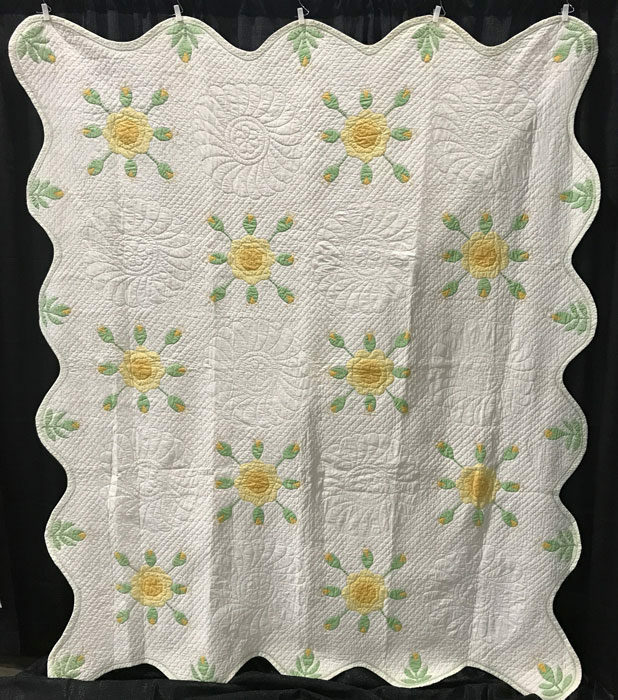 The maker has a lovely layout of floral appliqué and a quilted wreath design. 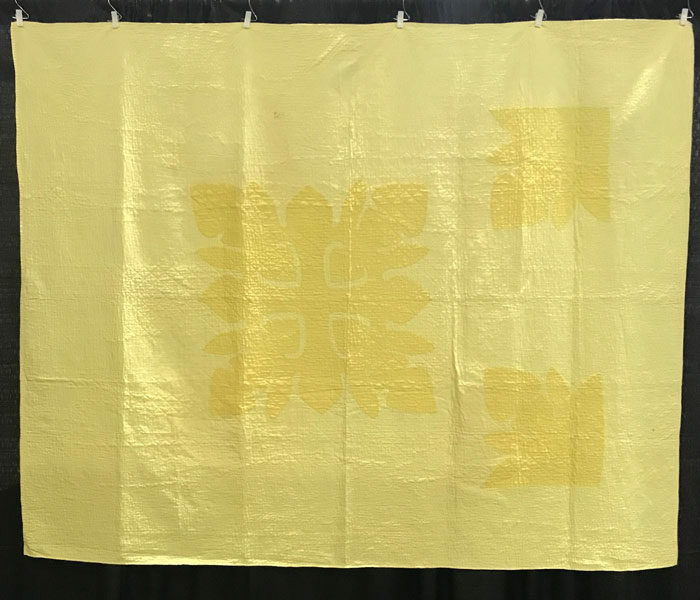 This is a tone-on-tone yellow appliqué–Hawaiian style. 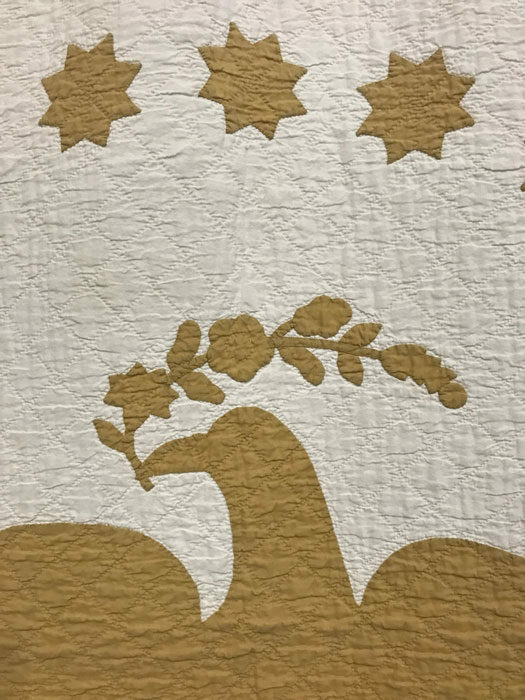 I admire the way the maker changed from the cross-hatching in the body of the quilt to a pumpkin-seed or orange peel design in the border. 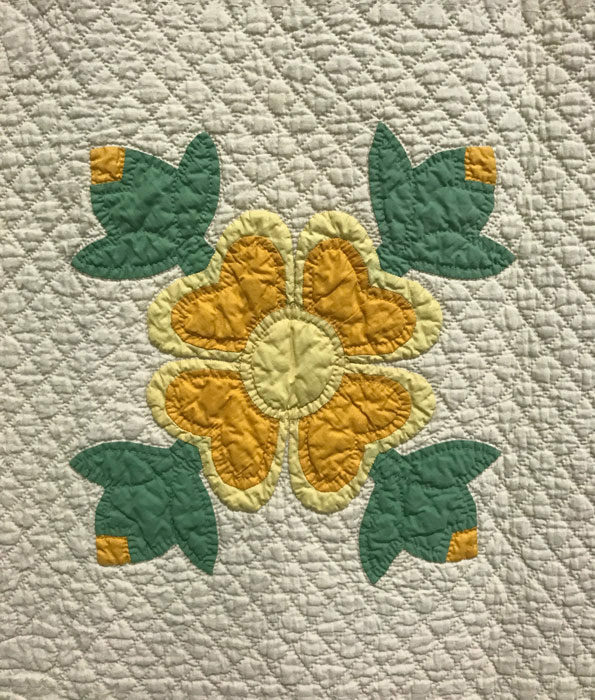 Although my first love is appliqué and that is what I do, sometimes I’ve been attracted to a few pieced quilts. 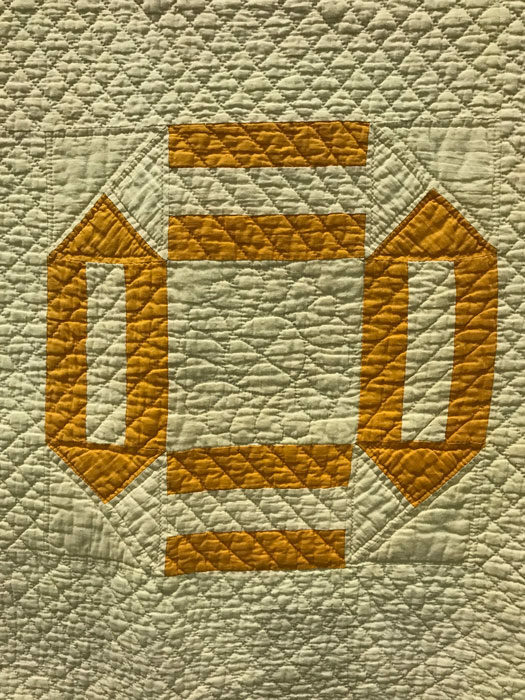 This quilt is a London Roads variation. This final quilt was a rescue. 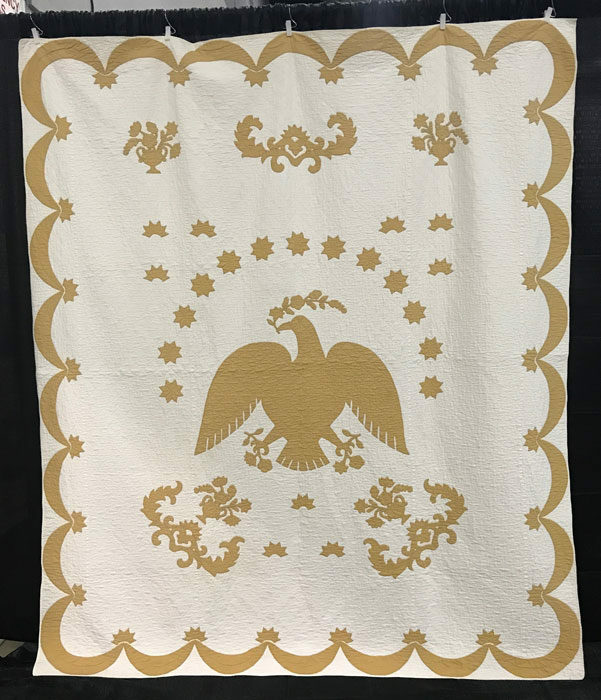 I saw it at the antiques show at the Expo center here in Portland, and it was quite dirty. I took it home and soaked it in a bucket of Biz per Martha Pullen, well-known for her heirloom embroidery. I rinsed it well and laid it out in the grass to dry. 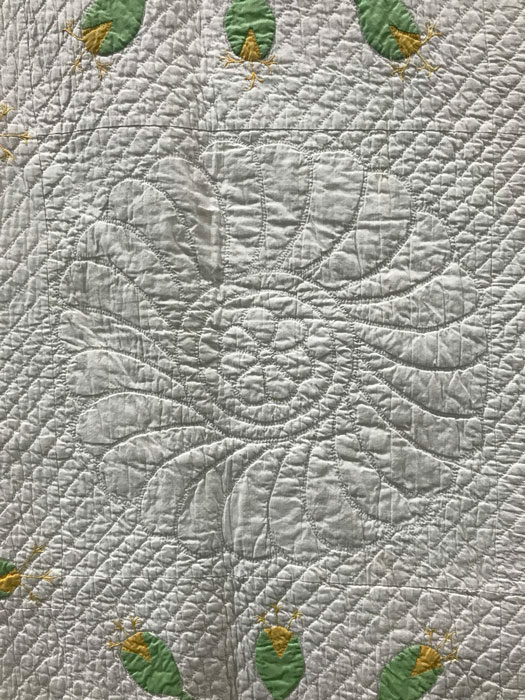 While it’s not the most gorgeous quilt, the cleaning made a huge difference, and now the quilt is more than serviceable. This is a second London Roads variation.